While modern smartphones have placed sophisticated video games right at our fingertips, there’s still something irresistible about visiting an old-school arcade – the kind you probably hit up more than once as a kid. Thankfully, someone came up with the idea of giving adults a side of gaming nostalgia with their cocktails via the arcade bar, and the idea has become a bona fide trend around the country. There’s no hotter neighborhood in Downtown LA than the Arts District with its bevy of new bars and impossible-to-get-into restaurant openings happening monthly. 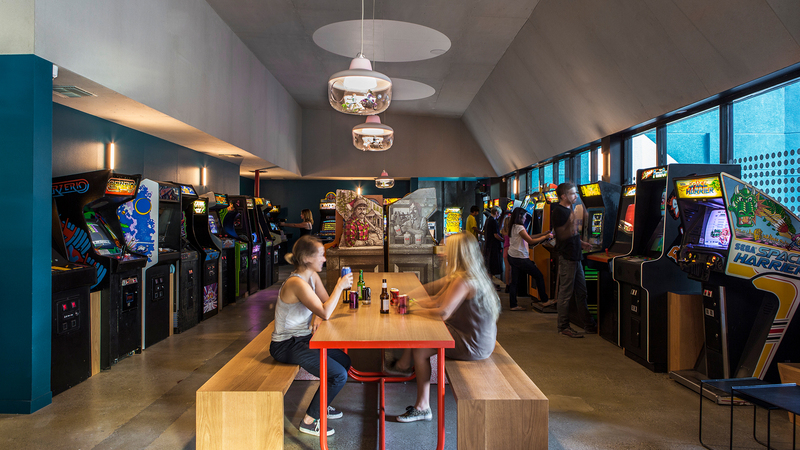 This indoor-outdoor arcade bar has been an area staple for several years now, drawing cool crowds who come for the rotating game collections, solid pinball machine offerings, expansive patio, craft cocktail menu, and nightly live DJs. For die-hards, there are even weekly pinball leagues and monthly tournaments. 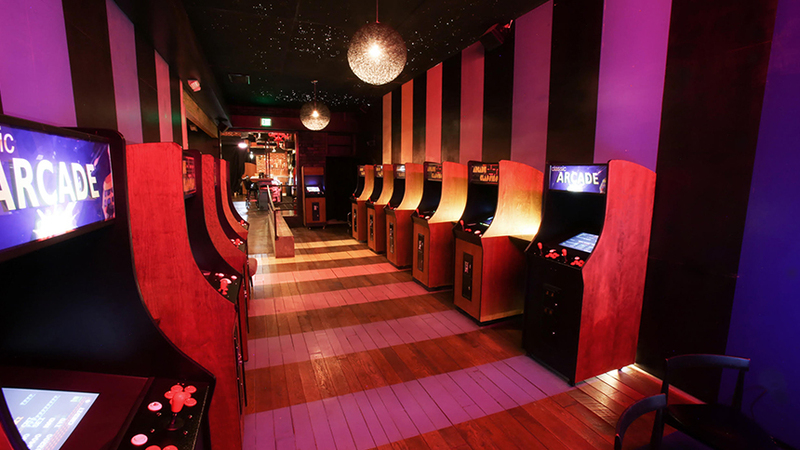 Just a token’s throw from Dodger Stadium, this arcade bar (which really does use the old-school token system) posts its current roster of games from Mario Bros. to Mortal Kombat II online so you can make sure your favorites will be waiting for you before you go. There’s also a massive list of beers by the can and bottle along with a dinner and late-night menu that skews Asian with stuff like shrimp and pineapple fried rice, double-fried tamarind wings, and grilled Brussels sprouts with miso. Retro Game Highlights: Millipede, Super Punch-Out!! We’re about to share a too-good-to-be-true tidbit about this Valley arcade bar: All of the games are free. You simply show up after 7 pm and test your joystick skills to your heart’s content. If you decide to go early, you may not get free games, but The One Up runs a great nightly happy hour with well drinks, wine, beer, and bites on special from 4 to 7 pm, and – in case you need to give your mundane Monday a boost with a couple of rounds of Robotron – happy hour goes all day then. Think of it kind of like a bonus round! No pretty and polished newfangled arcade bar here. This Koreatown game den is on the smaller side, only accepts cash, offers reasonably priced drinks, and doesn’t even have a website (gasp!). Some of the games are showing their age, but that’s all part of the allure of the divey Blipsy where the walls are lined with old toys and stuffed animals sit alongside the liquor bottles behind the bar. Thanks to its proximity to The Wiltern (about a mile away), it doubles as a great venue to grab a drink and get in a game or two before a show at the theater. 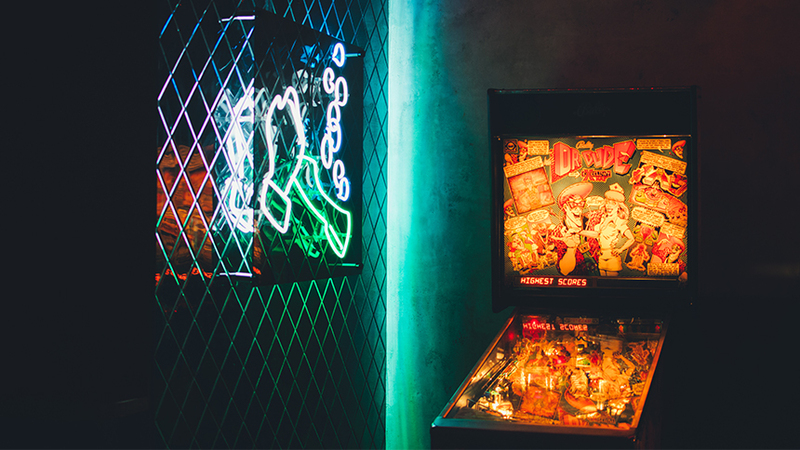 There are only a handful of video games and pinball machines here, but for the ‘80s obsessed, this neon-covered bar bathed in a retro red glow with exposed brick, comics on the walls, and Tiffany-style lamps hanging from the ceiling is a must-stop. Tucked behind sister spot Bar Clacson, the place focuses its drink menu on old-school high balls like a gin and tonic or Jack and ginger ale done with soda guns. See? ‘80s all the way.